Secretary of the Savills Countryside Alliance Point-to-Point, Jane Stockdale, is the latest recipient of the Countryside Alliance’s service award. The secretary of the Savills Countryside Alliance Point-to-Point, Jane Stockdale, has been awarded the Countryside Alliance’s service award – The Goodson-Wickes Trophy. 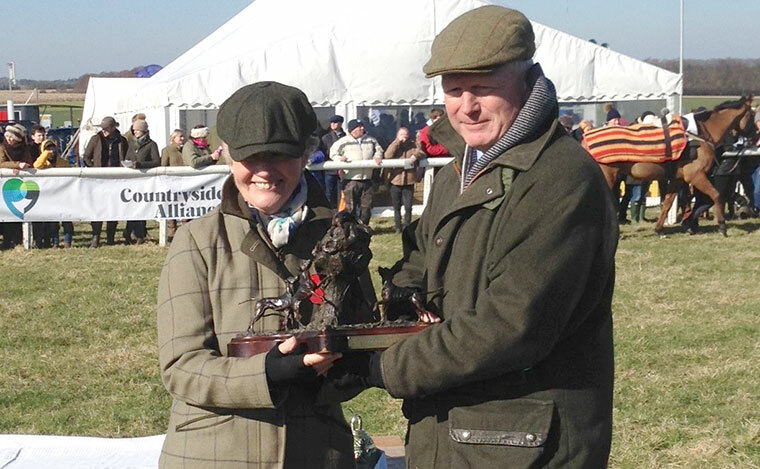 The attractive bronze trophy was handed over to Mrs Stockdale at the point-to-point at Badbury Rings, Dorset on 25 February by Countryside Alliance chief executive Tim Bonner, in recognition of 10 years of running the annual event. The Goodson-Wickes Award is so named as its first recipient was the first chairman of the Countryside Alliance – Dr Charles Goodson-Wickes in 1999.